This line is from the opening poem of The Butterfly Effect, a stunning collection of poetry by Susan Hawthorne that was ten years in the making. 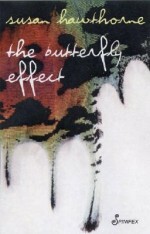 The “butterfly effect” refers to a principle of chaos theory that “small differences in the initial condition of a dynamical system may produce large variations in the long term behavior of the system.” Hawthorne’s verses reverberate with the cumulative effect of historical lesbian lives, picking up momentum and sweeping the reader along in a torrent of ideas and artifacts that may at first appear chaotic, but which are brilliantly synthesized to illustrate the potential global impact of lesbian culture. 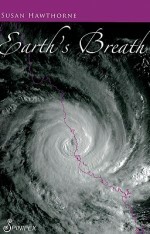 In Earth’s Breath, a collection of poems about a Category-5 cyclone, the subject is again chaos. In 2006, Hawthorne, her partner, and her dog survived the havoc of Cyclone Larry along the northeast coast of Australia. This first-person account is harrowing, beginning with the advance warnings and the preparations in the eerie calm-before-the-storm, and ending with descriptions of the scarred landscape two years later. As with her two previous collections, Earth’s Breath depicts a vast historical and emotional landscape through meticulous attention to detail. In this case, much of the detail reflects the poet’s love of the natural world: She writes of the frigatebirds, the olive python, the white cockatoos, the green tree frog—and “a landscape of skeletons/ trees in spiral twist, trunks unbarked, vertebrae exposed/ tarsal and metatarsal, twig and branch.” After the cyclone, she describes the emergence from the house, the first contact with a neighbor, the media coverage, the clean-up, and the replanting. 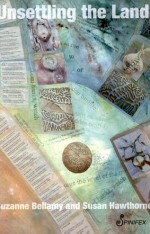 The poems progress to depictions of “the cyclone inside,” as her post-traumatic symptoms develop. The ripples of the storm continue outward, from the personal to the political, as Hawthorne makes connections to cyclones in Burma and Bangladesh, other Australian cyclones, and to Hurricane Katrina. Susan Hawthorne, a scholar of Ancient Greek and Sanskrit, is the co-founder of Spinifex Press, Australia’s largest feminist press and publishers of an impressive roster of international lesbian writers. In addition to her lesbian activism, Hawthorne is also an aerialist who has performed in women’s and lesbian circuses in Australia. 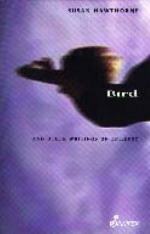 In the title poem of Bird, the poet tells of her dream of becoming an aerialist and how, as a girl living with epilepsy, this dream was obstructed. In spite of institutional resistance, Hawthorne found a way to fly, and it is this indomitable spirit, informed by a radical lesbian and feminist perspective, that lifts her poems and her readers above the chaos. What a great review. Thanks. If you want to hear a reading go to this site at Poetica.